Our authorities for representing the pentagram or the five-pointed star as the microcosm, and the six-pointed double triangle as the macrocosm, are all the best known Western Kabalists—mediæval and modern. Éliphas Lévi (Abbé Constant) and, we believe, Kunrath, one of the greatest occultists of the past ages, give their reasons for it. 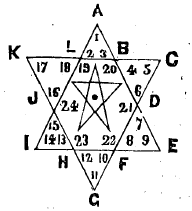 In Hargrave Jennings’ Rosicrucians the correct cut of the microcosm with man in the centre of the pentagram is given. There is no objection whatever to publish their speculations save one—the lack of space in our journal, as it would necessitate an enormous amount of explanations to make their esoteric meaning clear. But room will always be found to correct a few natural misconceptions which may arise in the minds of some of our readers, owing to the necessary brevity of our editorial notes. So long as the question raised provokes no discussion to show the interest taken in the subject, these notes touch but superficially upon every question. The excellence of the above-published paper [“The Six-pointed and Five-pointed Stars,” by Krishna Shankar Lalshankar], and the many valuable remarks contained in it, afford us now an opportunity for correcting such errors in the author’s mind. Believing that we have now sufficiently explained some of the difficulties, and shown that the Western Kabalists always had regard to the “trinity in unity” and vice versâ, we may add that the Pythagoræans explained away the “objection” especially insisted upon by the writer of the above words about 2,500 years ago. The sacred numbers of that school—whose cardinal idea was that there existed a permanent principle of Unity beneath all the forces and phenomenal changes of the universe—did not include the number two or the Duad among the others. The Pythagoræans refused to recognize that number, even as an abstract idea, precisely on the ground that in geometry it was impossible to construct a figure with only two straight lines. It is obvious that for symbolical purposes the number cannot be identified with any circumscribed figure, whether a plane or a solid, geometric figure; and thus, as it could not be made to represent a unity in a multiplicity as any other polygonal figure can, it could not be regarded as a sacred number. The number two, represented in geometry by a double horizontal line ==, and in the Roman numerals by a double perpendicular line ||, and, a line having length, but not breadth or thickness, another numeral had to be added to it before it could be accepted. It is only in conjunction with number one, thus becoming the equilateral triangle, that it can be called a figure. It thus becomes evident why, in symbolizing Spirit and Matter (the Alpha and Omega in the Kosmos), the Hermetists had to use two triangles interlaced (both a “trinity in unity”), making the one typifying Spirit white with chalk, and the other typifying Matter black with charcoal. To the question, what do the two other angles of the white triangle signify, if the one “white point ascending heavenward symbolizes Spirit”—we answer that, according to the Kabalists. the two lower points signify “Spirit falling into generation,” i.e., the pure divine Spark already mixed with the Matter of the phenomenal world. The same explanation holds good for the two base angles of the black triangle; the third points showing respectively the progressive purification of Spirit, and the progressive grossness of Matter. Again, to say that “any thought of upward or downward” in “the sublime idea of the Kosmos” seems “not only revolting but unreal,” is to object to anything abstract being symbolized in a concrete image. Then why not make away with all the signs altogether, including that of Vishnu and with all the learned Paurânik explanations thereof given by the writer? And why should the Kabalistic idea be more revolting than that of “Death, Devourer, Time,” the latter word being a synonym of Endless Eternity—represented by a circle surrounding the double triangle? Strange inconsistency, and one, moreover, which clashes entirely with the rest of the article! If the writer has not met “anywhere with the idea of one triangle being white and the other black,” it is simply because he has never studied, nor probably even seen the writings and illustrations of Western Kabalists. The above explanations contain the key to the Pythagoræan general formula of unity in multiplicity, the One evolving the many, and pervading the many and the whole. Their mystic Dekad (1 + 2 + 3 + 4 = 10), expresses the entire idea; it is not only far from being “revolting” but it is positively sublime. The One is the Deity; the Two Matter—the figure so despised by them as Matter per se can never be a conscious unity. 3 The Three (or Triangle), combining Monad and Duad, partaking of the nature of both, becomes the Triad or the phenomenal world. The Tetrad or sacred Tetraktys, the form of perfection with the Pythagoræans, expresses at the same time the emptiness of all—Mâyâ. While the Dekad, or sum of all, involves the entire Kosmos. “The universe is the combination of a thousand elements, and yet the expression of a single element—absolute harmony or spirit—a chaos to the sense, a perfect kosmos to reason,” we say in Isis Unveiled. Pythagoras learned his philosophy in India. Hence, the similarity in the fundamental ideas of the ancient Brâhmanical Initiates and the Pythagorists. And when in defining the Shatkon, the writer says it “represents the great universe (Brahmânda)—the whole endless Mahâkâsha—with all the planetary and stellar worlds contained in it,” he only repeats in other words the explanation given by Pythagoras and the Hermetic philosophers of the hexagonal star or the “double triangle,” as shown above. Nor do we find it very difficult to fill up the gap left in our brief note in the August number as to the “remaining three points of the two triangles,” and the three sides of each element of the “double triangle” or of the circle surrounding the figure. As the Hermetists symbolized everything visible and invisible they could not fail to symbolize the macrocosm in its completeness. The Pythagoreans who included in their Dekad the entire Kosmos, held the number twelve in still higher reverence as it represented the sacred Tetraktys multiplied by three, which gave a trinity of perfect squares called tetrads. The Hermetic philosophers or Occultists following in their steps represented this number twelve in the “double triangle”—the great universe or the macrocosm as shown in this figure—and included in it the pentagram, or the microcosm, called by them the little universe. Dividing the twelve letters of the outer angles into four groups of triads, or three groups of tetrads, they obtained the Dodekagon, a regular geometric polygon, bounded by twelve equal sides and containing twelve equal angles, which symbolized with the ancient Chaldæans the twelve “great gods,” 4 and with the Hebrew Kabalists the ten Sephiroth, or creative powers of nature, emanated from Sephira (Divine Light), herself the chief Sephiroth and emanation from Hakoma, the Supreme (or Unmanifested) Wisdom, and Ain-Suph the Endless; viz., three groups of triads of the Sephiroth and a fourth triad, composed of Sephira, Ain-Suph and Hakoma, the Supreme Wisdom which “cannot be understood by reflection,” and which “lies concealed within and without the cranium of Long Face,” 5 the uppermost head of the upper triangle forming the “Three Kabalistic Faces,” making up the twelve. Moreover, the twelve figures give two squares or the double Tetraktys, representing in the Pythagoræan symbology the two worlds—the spiritual and the physical. The eighteen inner and six central angles yield, besides twenty-four, twice the sacred macrocosmic number, also the twenty-four “divine unmanifested powers.” These it would be impossible to enumerate in so short a space. Besides, it is far more reasonable in our days of scepticism to follow the hint of Iamblichus, who says, that “the divine powers always felt indignant with those who rendered manifest the composition of the Icosahedron,” viz., those who delivered the method of inscribing in a sphere the Dodekahedron, one of the five solid figures in geometry, contained by twelve equal and regular pentagons—the secret Kabalistic meaning of which our opponents would do well to study. In addition to all this, as shown in the “double triangle” above, the pentagram in the centre gives the key to the meaning of the Hermetic philosophers and Kabalists. So well known and widespread is this double sign that it may be found over the entrance door of the Lhakhang (temples containing Buddhist images and statues), in every Gong-pa (lamasery), and often over the relic-cupboard, called in Tibet Doong-ting. The mediæval Kabalists give us in their writings the key to its meaning. “Man is a little world inside the great universe”—Paracelsus teaches. And again: “A microcosm, within the macrocosm, like a fœtus, he is suspended by his three principal spirits in the matrix of the universe.” These three spirits are described as double: (I) the spirit of the elements (terrestrial body and vital principle); (2) the spirit of the stars (sidereal or astral body and the will governing it); (3) the spirits of the spiritual world (the animal and the spiritual souls); the seventh principle being an almost immaterial spirit or the divine Augoeides, Âtmâ, represented by the central point, which corresponds to the human navel. This seventh principle is the personal God of every man, say the old Western and Eastern Occultists. Therefore it is that the explanations given by our critic of the Shatkon and Panchkon rather corroborate than destroy our theory. Speaking of the five triangles composed of “five times five” or twenty-five points, he remarks of the pentagram that it is a “number otherwise corresponding with the twenty-five elements making a living human creature.” Now we suppose that by “elements” the writer means just what the Kabalists say when they teach that the emanations of the twenty-four divine “unmanifested powers”—the “unexisting” or “central point” being the twenty-fifth—make a perfect human being. But without disputing upon the relative value of the words ‘‘element’’ and “emanation,” and strengthened moreover as we find the above sentence by the author’s additional remark that “the entire figure” of the microcosm, “the inner world of individual living being,” is “a figure which is the sign of Brahma, the deified creative energy”—in what respect, we ask, does the above sentence so much clash with our statement that some proficients in Hermetic philosophy and Kabalists regard the five points of the pentagram as representing the five cardinal limbs of the human body? We are no ardent disciple or follower of the Western Kabalists, yet we maintain that in this they are right. If the twenty-five elements represented by the five-pointed star make up a “living human creature” then these elements are all vital, whether mental or physical, and the figure symbolizing “creative energy” gives the more force to the Kabalistic idea. Every one of the five gross elements—earth, water, fire, air (or “wind”) and ether—enters into the composition of man, and whether we say “five organs of action” or the “five limbs” or even the “five senses,” it means all one and the same thing, if we would refrain from hair-splitting. 1. The Book of Splendour, written by Simeon Ben Iochai, in the first century B.C. ; according to others in the year A.D. 80. 3. Compare Kapila’s Sânkhya—Purusha and Prakriti; only the two combined when forming a unity can manifest themselves in this world of the senses. 4. According to Haug’s Aitareya Bráhmana, the Hindu Manas (Mind) or Bhagavân creates no more than the Pythagoræan Monas. He enters the Egg of the World and emanates from it as Brahmâ, as itself (Bhagavân) has no first cause (Apûrva). Brahma, as Prajâpatî, manifests himself (as the androgyne Sephira and the ten Sephiroth) as twelve bodies or attributes which are represented by the twelve Gods symbolizing (1) Fire, (2) the Sun, (3) Soma, (4) all living Beings, (5) Vâyu, (6) Death—Shiva, (7) Earth, (8) Heaven, (9) Agni, (10) Âditya, (11) Mind, (12) the great Infinite Cycle which is not to be stopped. This, with a few variations, is purely the Kabalistic idea of the Sephiroth. 5. Idra Rabba, vi. 58.